I’ve talked before about how self-care can be a difficult thing for me. “Self-care” sound like such a frivolous thing, especially to someone like me. I struggle with perfectionism and caretaking for others, so self-care can feel self indulgent and unnecessary. But I am realizing, more and more, that self-care is actually a vital ingredient in me being a good writer, a good mother, and a healthy person. It is something I am trying to take seriously this year. As such, I’ve made some goals for myself this summer. It’s embarrassing to admit this, but there are days when I don’t leave my house until I pick up my children from school, and then we get home and I stay indoors until bedtime. I live in a beautiful place with outstanding weather, and yet I find myself indoors more often than not. I want to spend a little bit of time outside and in nature every single day. That can be taking a walk around the block, sitting on my porch swing, joining the kids in their treehouse, or taking a trip to the beach. I want to have at least 30 minutes of time in nature every day. It is grounding, and always makes me feel more sane. Last year, we moved into a neighborhood with an amazing bike path that goes all the way to the beach. Sadly, I have only taken this path to the beach once. A large part of that was that I had an old, creaky bike that made the trip laborious. Schwinn just sent me a new bike, and I’m excited to get it out on the path more often. 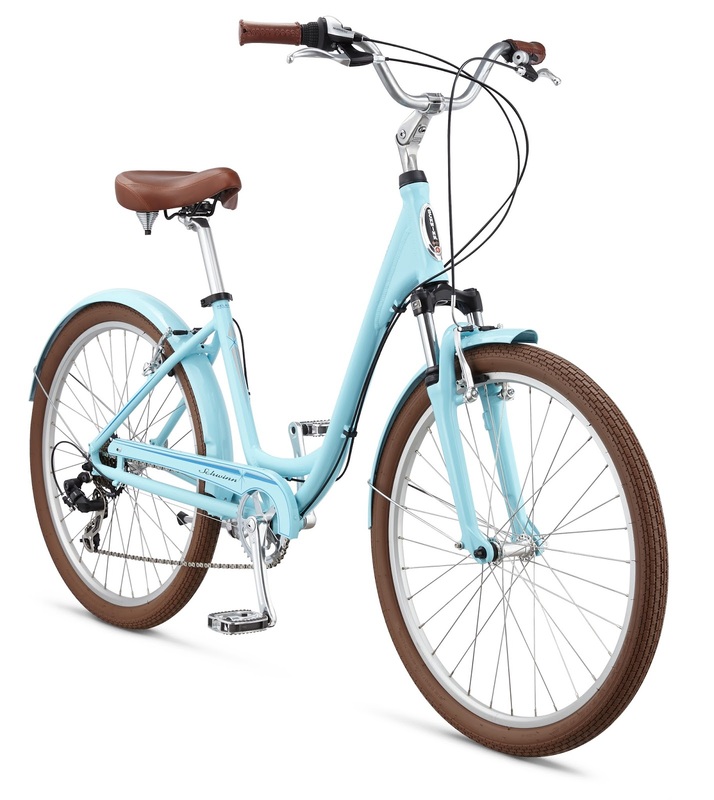 It’s Schwinn’s Streamliner 1 Step-Thru bike, and it’s made specifically for bike path riding. 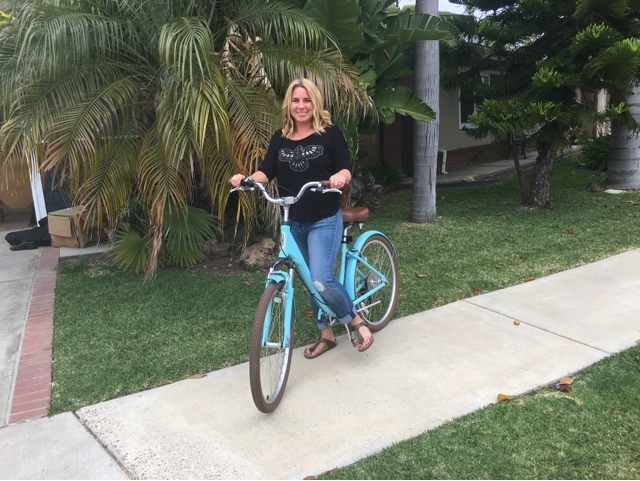 Part beach cruiser, part 7-speed, and it’s powder blue with leather handles and seat. I like it a lot. In the new house, we built a bike shed with a path out to the front yard, to make it easier to get our bikes in and out of storage. 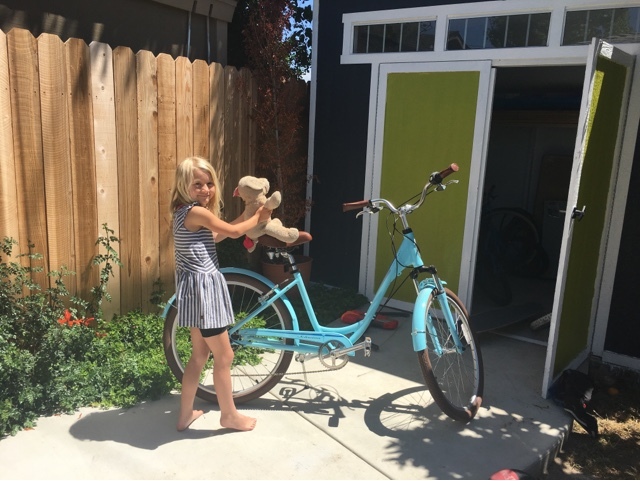 I’m hoping a new, comfortable bike and easy storage will encourage me to ride more. Last week, I wrote about how I am in the process of taking care of some dental issues that I have been putting off for a few years. I have also made a resolution to finally get that I exam, because I suspect it’s time for me to actually get some glasses. Things are blurry and I’m doing the old lady “hold things three feet away from your face” thing in order to read things. And also fun we’re going to make that appointment with an ear, nose, and throat doctor to deal with my deviated septum. These are all things that I have been avoiding, but I am going to make them a priority this summer. I think it’s an unfortunate symptom of our collective screen addiction, but I find myself flipping through Facebook and Instagram in bed these days instead of reading a book. I used to read about an hour every night, but instead, lately I am at mindlessly thumbing through social media. I hate this. I really wants to get back into the habit of reading books on the regular. I have to admit, I have not always enjoy playing games with my children. A large part of this is because the age span of my kids means I have always had one kid who was too young to play along, but totally insistent that she be included. That led to frustration for everyone. All of my kids are finally old enough to be able to follow the rules in Uno or Scrabble or Monopoly, and I want to make this a habit in our family life. I had a major sweet tooth. Sugar has been a problem for me all my life. Over the last few months, I have made some changes in my diet and greatly reduced how much sugar I eat. It has made a world of difference for me. I don’t have energy crashes in the afternoon, and I also don’t crave sweets as much when I keep it in check. I am trying to limit sugar to a once-a-week indulgence, and stick to fruit for satisfying my sweet tooth. Those are my goals. Nothing too extreme, so I am hoping I can stick to them, and feel a bit more sane this summer.